Welcome to our Festival supporters website set up to complement the Medway Council web pages in supporting the Rochester Dickens Festival and Dickensian Christmas. On our pages you will find news, information, pictures, and images. 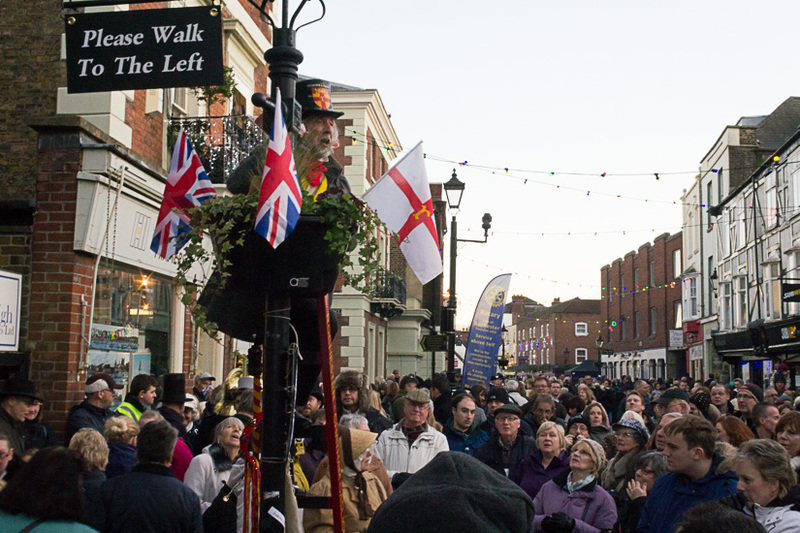 Twice a year Dickens enthusiasts, strolling players, re-enactors, Dickensian 'characters', not to mention a few oddballs, join the public in a Festival to commemorate and celebrate the life of Charles Dickens. In recent years we have welcomed steampunks into our ranks, in particular members of the Great Kentspectations group. This site is here mainly for the benefit of all supporters of the Festivals, and to encourage anyone who is thinking about joining in the fun. We have no official status, but keep in contact with the Festival organisers. We have updated the site, and we are gradually introducing a new way of presenting pictures - you can click on most small images to see a larger image or slide show. We hope you like it, but please do let us know about any problems. This page carries the usual 'housekeeping' information including our 'cookies' policy, and the menu bar to the left of all pages takes you to other useful topics. Click here to go to our News page. If you want to contact the organisers of the festivals, you need Medway Council. Their festival web pages aren't always available, so the best course is to go to their events page and enter 'Festivals' and 'Rochester' in the 'Events' box. Alternatively, you can contact Medway Visitor Centre. We welcome your Festival news, as well as links to your Festival pictures or videos. If you have just a few photos they can be attached to an email, but if you have a lot the best way is to share them with us on a photo sharing site or send them to us on a file transfer site, then send us the link. There are lots of these sites around, but Microsoft's 'Onedrive' does the job, it's free, it works on any platform, and the recipient doesn't have to register (use the 'get a link' sharing option and send us the link). We only publish low resolution photographs (usually with a height of 550 pixels and width in proportion). Our own pictures are made available under a 'Creative Commons' licence which allows non-commercial use under strict conditions. Other people's pictures we publish are copyright of the photographer unless they ask for a different arrangement. Videos are best uploaded to 'Youtube', then send us the link. Visitors may be aware of changes in European law regarding the use of 'cookies'. This site does not by design use any cookies, and as far as we know there are no third party cookies. However, if you have any concerns you should disable cookies in your browser. Equally important, tell us of your concerns! Any website use of our images MUST include a link to this site.